Oh, my favourite Polish recipe is just the simplest thing – Jajecznica. Scrambled egg , boosted with the smokey flavours of sausage or pork. My father used to make it for us when mum was busy – so, even though it was man-cooking, it was always a special treat. My favourite version is with sliced Krakowska, but you can use smoked pork loin or even smokey bacon , perhaps even adding some sliced fresh mushrooms. 4 eggs, 6 slices of Krakowska sausage or smoked pork loin. Chop your sliced Krakowska into bite-size pieces and cook it lightly in a nonstick pan with a little butter. Meanwhile beat the eggs with a wooden spoon, don’t use a blender. When the sausage is lightly browned, stir the eggs into it. Stir constantly with your wooden spoon. 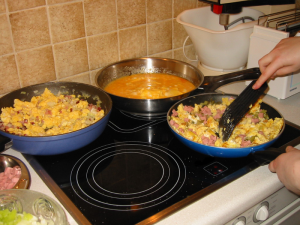 As soon as the eggs start to set, but while they are still soft, serve immediately onto heated plates. A sprinkle of paprika helps the flavours mingle deliciously. Rye bread and butter on the side, of course. Best when snow is on the ground, but any other time of year will do just fine. Yum, yum!